The aqua hike consists in going through a part of the river, in the water by floating in the water rapids and on	the banks. Some pathways offer the opportunity to do high jumps, slides, water games and underpasses. Unlike canyoning, the aqua hike does not include abseiling because there aren’t any waterfalls. The rivers are wilder. Aqua Hikes in the Verdon are taking place in the Verdon itself. The surroundings are breath taking. You will imbibe this	exceptional	natural habitat. Nevertheless aqua hikes in the Verdon aren't for beginners; as	the hikes demand a	good physical shape. We	offer two types	of	aqua hikes,	which will allow you to	discover the beauty	of Verdon and experience feeling small in gigantic places. The Imbut aqua hike will allow	you	to visit the meandering of the river. It's a fun aquatic activity with numerous jumps and water	games. This	activity is	intended to	people with	good physical condition. 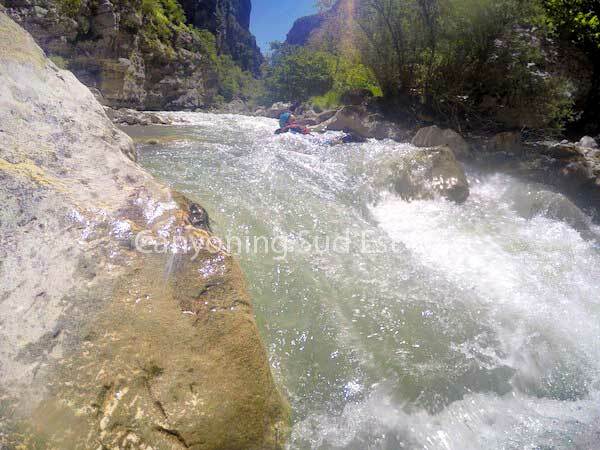 The aqua-hike of Samson's corridor	invites you to visit the entry of the gorges with numerous jumps and fun water games in	incredible surroundings. Be	careful : The canyon is	over-populated during summer.